October was a very wet month this year, it seemed to be raining all the time. The "Does the weather affect the drums that much?" conversation was an icebreaker at a couple of the gigs this month. It does. When I first started studying tabla in California we were always keenly aware of the wind. If the wind blew in the desert, it meant that whatever little moisture was in the air was gone and all the drums dried up and got tight. In Michigan it is the opposite, the air gets very humid and the drum heads all loosen and get thick. Either way, your instrument is in need of constant attention to stay in tune and sounding nice. Musicians often refer to their instrument as a living entities, and I believe it stems from the fact that in order for the instrument to do what you want it to do, you must care for it every time you are in contact with it. Each instrument has its own set of sound characteristics that can literally resonate our bodies in ways that feel absolutely fabulous. When just one little thing changes, like a string coming just out of tune, or a loose component starts to rattle, the feeling can evaporate and we are left wondering why the same song that gave us joy yesterday is today giving us anxiety today. Even moving your instrument to a different room, or changing how you hold it will affect the sound. When a musician starts talking to, naming, and adoring their instrument, it is not (always) dillusional, crazy, vein, or for entertainment....no....I like to think that it comes from a moment where that instrument resonated deeply and joyfuly with the musician, giving them something they could not get anywhere else. Have you ever seen Willie Nelson's guitar? Not exactly a practical choice for the rigors of touring, but an old friend that rings out a layer of sound unlike any other. I wonder...does he have a name for it? I love going into new situations and different spaces to play music. As a percussionist, I don't always get to bring the same instrument, but this month seemed to be all tabla gigs. It has been great, since I have been so inspired by my Guruji's visit last month. I have been practicing everyday for at least an hour and the tabla have been opening up to me. I am not sure how else to put it...I guess I feel like I am getting more out of my tabla now than I ever have and it is driving me to practice more and more. I have also been saying yes to a lot of tabla gigs just to have an opportunity to play them outside the practice realm. Meeta Banerjee and I have played music at 10,000 Villages every year since their opening, and this year they asked us back for an anniversary party. The stores concept is great, they are a non-profit fair trade goods store. Everyone who works there is a voulenteer, so there are always new faces working when we play. This year we were sitting directly across from the cash register, so the voulenteers got to see us head on. In years past we have been on the same side and a bit removed from their view, so this was a nice change. It felt more like we were giving a concert. One lady saw me play the tabla and immediately went over to their drum display and picked up a baya. She said she always wondered how you play them and now she wanted to try. She set it on top of the countertop, took a good look at my hand to get the technique, and then tried to play. One problem...she had no ring under the drum. As soon as she laid her hand on it, it slid across the countertop, flipped over and slammed down on the glass. She nervously laughed and said "sorry" and put the drum away. Meeta and I just smiled and kept playing. The next day found Meeta and I at a lunchtime Indian wedding reception in the Bloomfield Hills area at some private country club. It was the first wedding for Meeta and I, and we had no idea how it would go over. We had a nice little stage and I brought a sound system. We got all set up and the sound was really great, so that relaxed us and got us excited to play. We knew that it would be one of those events where we were just the back ground music, so we played nice and light. When we finished our first piece the whole group, about 250 of them, gave a rousing applause. It took us both off-guard. We did not think that people were even listening. I would have loved to have a picture of our faces when the applause came, I am sure we looked surprised. So that changed the tone for the whole rest of the event. Now people started coming up to us and requesting certain rags, and some were walking by guessing the rag we were playing and telling us stories about when they used to play. It felt very comfortable and friendly. I had a moment when I almost lost the beat when I saw a large gentlemen lose his pants right down to his ankles as he got to the end of the buffet line with both hands full of food. It was hilarious in a funny-home-video way. I could not get Meeta to look over without attracting too much attention, so it was a moment for me, the guy, and the server that was also standing right there. If the server and I would have caught each others eyes after it happened, I think the bubble would have burst, and I would have lost it completely. As it happened, we finished the song, the guy pulled himself together and the afternoon went on normaly. Meeta and I finished up, got a bite to eat, and headed home. It was a nice show to play. The next day I was at a house in the Bloomfield Hills area, (again) playing tabla for a small kirtan with Judy Piazza. She was in town for a little while and asked me a few days before if I would play with her. I was excited to not just because we have made great music in the past, but she was also playing with her newly developed instrument, the 'Dulcitar'. It was beautiful, and sounded great. It is a bit hard to explain, but it sits flat on the ground and there are the regular dulcimer strings in the middle on the inside there are some strings with moveable frets and on the outside are the drone strings, very similar to the sitar's sympathetic strings, only these you can play easily. I wish I had a picture to share with you, but I am sure Judy will have one online soon, if she doesn't already. Anyway the most important part of any instrument is the sound, and the Dulcitar sounded great. Lot's of great layers that made two musicians sound like 3 or 4. It was a fun night. The room we were in had big windows that was letting in the soft evening light. We sat down, set up, and started to play. As we played, the sun went down and the room got darker and darker. When Judy asked everyone if they wanted to turn on some lights, they said 'no', so we ended up singing and playing in near darknes. It was very different, but also very nice. Turning off the lights seems to turn the silence up and hence, give the music a great space to exist without distraction. It was a nice change from the norm. 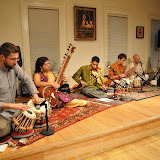 Two days later I was with Ann Arbor Kirtan at Friends Meeting House in Ann Arbor. It was nice. The kirtan experience seems to be growing on me. In the beginning I saw it as merely an opportunity to play tabla for two solid hours. Now I have been really getting into the meditative aspect of it. I try to close my eyes as much as possible, and keep my head clear. I think I have been able to do this because the other members of the group have really grown comfortable with the music. It has allowed me to go into my own space. When I first started with the group, (which is made up mostly of non-professional musicians), I kindly told them that it will take about 50 kirtan events before we all start feeling comfortable with the music, and I think that has played out to be mostly true. Now we can go through a whole night without much bobble or miscue and it is allowing everyone to enjoy the experience much more. It is really nice. No teacher, lesson, or instrument can give to a musician what time with the music can give. That is all it takes, (I guess you could say 'quality' time, just to be thorough about it). Just play, and enjoy what you play and every question will be answered through the music. To get good at music, you simply have to play. If you focus on playing what you love, then eventually you will love everything you play. This philosophy is what keeps me coming back to my instrument time and time again with excitement and desire. It does not matter where I am playing or who I am playing for, it just feels great to play. I feel blessed to have been able to do it this long, and I hope I can continue to play well into the future. After the Kirtan I had a full week before the next performance. It was Saturday the 24th at Crazy Wisdom Tearoom in Ann Arbor. We were slated to have the full Sumkali group, but Meeta had to cancel at the last minute, so we called upon a couple of the ICMD members at U of M to come in and fill the void. Mahesh joined us on the kanjira and Prakash was on the mrigdangam. With 4 percussionists it was bound to be a bold night of music making. We were fresh off the excitement of the UMS gig and we had some demo C.D. 's available thanks to the hard work of our bansuri player Scott Brady. He has been recording most of our shows and he mixed, mastered, and compiled over an hour of music to put on a C.D. So with actual merchandise to sling, it gave me an extra incentive to be the charming host. I think we sold something like 14 C.D. 's, which is great for a small venue like that. What is even better though, is that I felt like we put on a great show. Everyone was having a good time and the music was sounding great. I may be biased, but I fell like you can never have enough percussionists, provided they are listening well to each other. In this setting, Prakash and Mahesh did a great job of blending in and playing great, so the energy was high, and the crowd let us know. I am getting more and more excited about the Crazy Wisdom 'experience' each month. It seems to be getting better and better as the months go on. The following day I was back over in Troy, MI. at the Sommerset Inn for the Michigan State Medical Society's first ever International Cultures night. I was slated to play with Meeta Banerjee. There were lots of different performances from different parts of the world. We were the Bengali contingent, so we played a couple of Bengali folk pieces. It was a nice little show and continued on the same vibe that the entire month seemed to have, which was solid, good, and fun. The next Friday was an interesting gig, which was, once again, over on the Southeast side in Rochester, MI. at the Red Lotus Yoga Studio. I was playing a girbani kirtan with Mata Mandir, who has been recording and doing kirtan for many years. I got the gig from Trevor Eller, who is an Ann Arbor local yoga teacher and musician. He was also playing with us. Since there was no rehearsal, or talk about logistics of the show, I over packed for the show. I brought my tabla, a rug, and my audio suitcase with mics and short stands. It seemed like overkill, but I just wanted to be safe. When I showed up to the gig I heard that Mata's van had broken down the day before up in Canada and all his equipment was in it. They had secured a sound system to use, but it lacked a lot of essentials, so guess who got to come to the rescue! I couldn't believe that I had to use absolutely everything that I brought. As it turned out we got the sound dialed in just in time to start the kirtan. It was an interesting night. It was not the kirtan like I was used to in Ann Arbor. There were more sing-a-long chants, as opposed to call-and-response, and the audience clapped when the songs were over. It was a fun show, and I liked the mellow state of mind that Mata brought to the whole thing. He was really great to play with, and I hope to play with him again then next time he comes to town. So that is it for October. It was a great month of music making and I feel inspired to keep pushing forward. As the year starts to come to a close, I am feeling great full for the experiences I have been able to have. I have been working with Atmaram Chetainya on re-creating my website, and it is looking GREAT! Thanks At! I have also been busy behind the scenes organizing my online world including my picasa photo account, my google calendar, my blog, and e-mail lists. As I move forward in all of this great technology I hope to connect with more people, and continue to share my musical world with you. Thanks for reading and I hope to write again soon!